Moss can grow wherever it is cool and damp and, for this reason, roofs that are shaded by trees or other structures are more susceptible to moss growth. 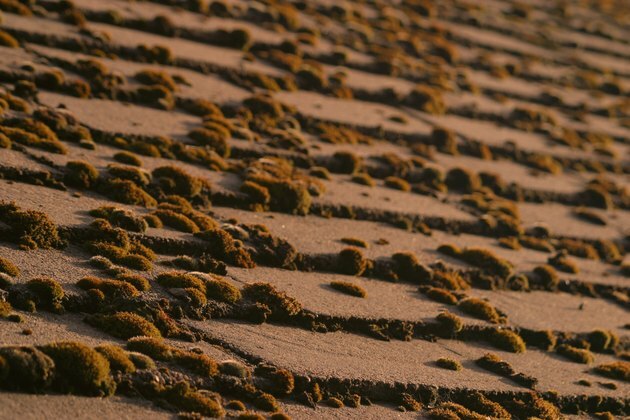 Having moss on your roof is not just an aesthetic issue, moss clumps can impede the flow of water down your roof and cause extensive damage to the roof itself. To prevent damage from occurring, kill the moss with a concentrated solution of hydrogen peroxide. Hydrogen peroxide is an oxidizer that is fairly harmless compared to other chemicals and will kill the moss. Don't let moss accumulate on your roof as it can cause damage. Fill a spray bottle with a concentrated hydrogen peroxide. The hydrogen peroxide sold in grocery stores and pharmacies is often 3 percent. Look for a higher concentration such as 25 or 30 percent to kill the moss more effectively. This type of peroxide can be purchased at a garden supply center, health food centers that supply green cleaning products or through an online supplier. Climb onto your roof equipped with your spray bottle and protective mask and gloves. Put on the gloves and mask and get to work spraying all areas where moss is currently growing. Saturate the moss with the hydrogen peroxide and let it slowly kill the moss. Complete a second treatment as necessary to kill the remaining moss. Use a power washer to remove the dead, dried moss off the roof once it has been killed.